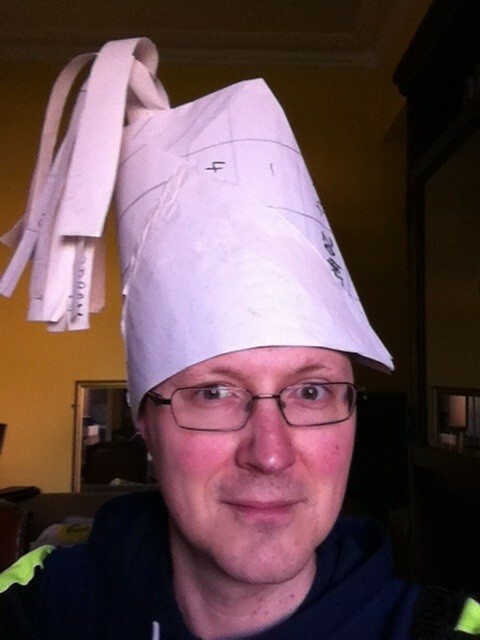 Write it big enough and your plot template can also provide a handy hat. I’m a big believer in templates and structures. For me, they enhance my creativity by giving me a structure to bounce off and a reminder of all the things it’s good to consider. When I put up my character template a few weeks back some people found it useful, so here’s another one, this time for writing plots. I’ve taken elements of this template from all over the place, but most importantly from Dan Wells’s seven point story structure. When I’m writing a short story I often just use this template, alongside a character template if I’m developing a new character. For longer works I use this sort of format for each plot strand, and then combine them using another template. Like I said, I love templates. So here’s my list of things to consider when planning a plot. If you find it useful, or can think of other things you’d add, or even have your own template to share, please let me know in the comments. Why is this series of events happening and important? What is the main char arc here? – yes, this might also be on the character template, but it’s important to tie it to the plot – who’s going to change, and how, as part of this. What’s the conflict, including its type – person vs person; person vs themselves; or person vs environment. What suspense keeps the audience engaged? What emotional exploration goes deeper? Start writing your story! Write 500 words, focusing on just one of the promises you’ve identified for your story. Then stop, and start writing another 500 words with a different promise. Aaaand then do it a third time. Promise 1: Blaze-Simms invents a bizarre steampunk defensive device. Dirk Dynamo wouldn’t have minded so much if the hot air balloon were plummeting toward the ground. Sure, they were losing altitude fast, and there was no way this would be a pleasant landing. But at least if they were heading toward the ground he could see what was coming, get ready to roll clear or dive into something soft just before they crashed. What bothered him was the trees. A vast swathe of dark German forest, broken by the occasional rocky outcrop. Sure, the leaves might soften the initial impact. But then the balloon would get impaled on branches, accelerating its descent. They’d be falling through twilight shadows and layers of concealing greenery onto no-one new what upward protruding spikes of wood or rock. Risking life and limb was fine, Dirk lived with that all the time. But he liked to know what he was getting into. And if possible, he wanted to live through it. “Any progress?” He glanced away from the approaching treetops and toward Sir Timothy Blaze-Simms, who was frantically disassembling and reassembling a mass of gears and gadgets in the corner of the basket. The Englishman looked a little too excited for a man facing imminent death, but then he always looked happy with a spanner in his hand. “Almost there.” Blaze-Simms twisted a bolt and something glowed in the contraption in his hand. There was a tearing sound and the balloon jolted as its ripped seam gave another few inches. Hot air hissed out onto the icy wind, and the treetops raced towards them. “Almost ain’t gonna cut it.” Dirk grabbed a rope and braced for impact. Leaping to his feet, Blaze-Simms slapped his device onto the side of the burner. He flicked a switch on its side. There was a whir, a rush of air that almost snatched Dirk’s coat off his back, and suddenly they were rising again. “Great work, Tim.” Dirk struggled to be heard over the rush of air, but he was sure the grin on his face would convey the message. Something was spinning on the top of Blaze-Simms’s device, while gears and levers rattled away around the glowing core. “That will give us six more hours,” Blaze-Simms shouted over the artificial wind rushing past them and up into the balloon. “Should be enough to get there,” Dirk shouted back. There was another ripping sound and they stopped rising, though at least they weren’t heading back down into the trees. Blaze-Simms looked up at the balloon, back down at his device, and then back up at the balloon again. Promise 2: A civilised dinner party in a building being bombarded by heavy artillery. Dirk Dynamo had expected that they might face trouble. He and Sir Timothy Blaze-Simms were heading toward the castle of someone they didn’t know, and who was helping their opponents. That wasn’t the sort of circumstances where you got a warm welcome. What he hadn’t expected was that the castle itself would be in trouble. “I say, what a spectacular view!” Blaze-Simms looked up from his notebook to take in the ground beneath their balloon. The forest below was a sea of green, broken by occasional jagged promontories. The tiled roofs of small German villages added variety to the scene, but their rustic charm was nothing compared with the view up ahead. Rising like a finger pointed toward heaven, the Red Castle rose in grandeur from the hilltop in front of them. “I’d expected it to be more, well, red.” Dirk turned the propeller Blaze-Simms had attached to the balloon basket, steering their course more directly toward the hilltop fortress. It was a place that had clearly been laid down a layer at a time over the centuries. At its base were walls and towers of grim grey stone, flat and functional, a defensive measure that could once have withstood any kind of assault. Above and behind them, within the protective circle of walls and steep hillsides, were additions of brick and timber frame, mixed in with a more refined kind of stonework in which elaborate arches played a prominent part. And above them all rose a tower more magnificent and ambitious than anything that had come before, many times as tall as the old walls were wide, a fairy tale castle of pale stone reaching to a tiled peak. As they grew closer, what had started as a meaningless muddle of human activity was turning into what could only be an army camp. Wagons emerging from the treeline showed that it was still growing, while men in blue uniforms set up tents and organised supplies. 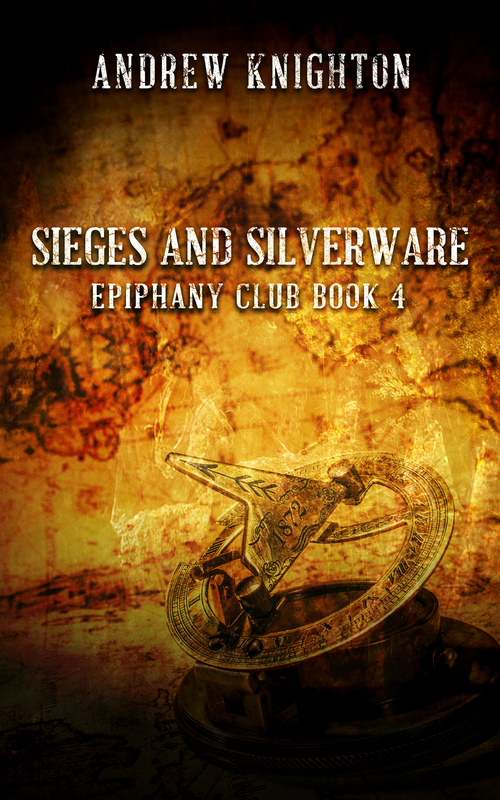 Artillery pieces were being arranged facing the castle walls, their aggressive intent clear. It took Dirk back to his own days fighting in a different blue. The memories weren’t all happy. Blaze-Simms pulled what looked like a snuff box from his pocket, unfolded and extended it until he held a telescope. He peered through the lens toward the castle. Dirk closed one eye and looked through the telescope toward the point on the battlements where Blaze-Simms was pointing. Three women stood watching the movement below, champagne flutes in their hands. Promise 3: Dirk and Isabelle reconciling their differences well enough to work together again. Night was falling as the hot air balloon reached the walls of the Red Castle. An elderly servant in a tailcoat supervised two teenagers in livery as they helped with the landing. Taking the ropes Dirk Dynamo threw to them, they secured the balloon by tying it to the crenelations. Even before they had finished, Dirk leapt from the basket down onto the stonework and looked around in the light of burning torches. Behind him, Sir Timothy Blaze-Simms scrambled out of the basket, accompanied by the clatter of gears and gadgets rattling in his pockets. The elderly servant stepped forward and held out a gloved hand. He said something in German. “Ah, you are British?” The butler’s expression didn’t change as he shifted into English, but Dirk thought there was slightly less of a formal edge to his voice. “Do I look like I’m carrying a card?” Dirk gestured toward the battered balloon, his filthy clothing, the bruises still fading from his face. Dirk felt like someone had grabbed hold of his insides and stirred them around until nothing was in its place and everything was knotted with tension. He fought to take deep, long breaths, calming his hammering heart. “That don’t seem likely,” he said through gritted teeth. Dirk thrust his hands into his pockets and nodded toward the door. This was really fascinating. I enjoyed all three beginnings, and without the exercise would only have ever written one. It’s made me think about which promises are most important, and which help set the tone of the book best, as well as drawing readers into the characters. If you’ve got any thoughts on which of these three is best, and why, then please let me know – I need to give this some serious thought. And if you’ve done this exercise or something like it, please share you’re thoughts on it below – I’d be intrigued to hear how you got on. Should Our Stories Ever Really End? As readers we crave closure. When that is threatened, as when an ongoing series is cancelled or its author dies, we feel disappointed or even cheated. And as writers we work toward closure, using structures that will provide readers with a satisfying ending. But is there another sense in which, with science fiction and fantasy in particular, one aim is to avoid closure and open up a never-ending imaginary world? 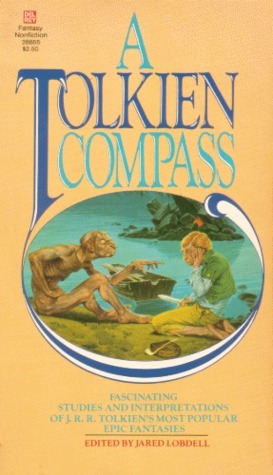 In his essay ‘The Interlaced Structure of The Lord of the Rings‘*, Richard C West argued that Tolkien’s novel created an effect “that might be called openendedness, whereby the reader has the impression that the story has an existence outside the confines of the book and that the author could have begun earlier or ended later, if he chose”. I think West’s argument ignores some essential features of the book he’s discussing, but it still raises an interesting point. Part of the appeal of Tolkien’s work is that it implies a far larger world and history, one which readers could explore both through his appendices and through their imaginations. In a sense, Tolkien provides firm closure, seeing a great threat ended and Frodo leaving Middle Earth. But in another sense, The Lord of the Rings leaves many questions unanswered in the reader’s mind. We can see this in many other works of fantasy and science fiction. They lead us to imagine a world far beyond the borders of their narratives. In a sense, their stories usually have clear, decisive beginnings and ends. But in another sense, the best leave their worlds open through the wealth of barely explored detail they provide. Perhaps this is part of the appeal of science fiction and fantasy – that it invites us to imagine beyond its boundaries in a way not all fiction can. What do you think? Do science fiction and fantasy somehow avoid closure? And is this distinctive to these genres? * Published in A Tolkien Compass, edited by Jared Lobdell. There’s a quote from the book that I included last week – ‘Structure is translation software for your imagination.’ I think that quote, and what it represents, are very useful in understanding the value of structure. Structure isn’t there to tell you what story to write or what ideas to discuss. It’s there to help you turn those ideas into something coherent and accessible, to fit your story into the form you’re writing in, whether it’s a novel, a screenplay or a haiku. have you given readers a character worth following? is there a disturbance to their life early on? is there a scene forcing the character into the confrontation of act two, and is it strong enough that the character can’t resist getting involved? These are ideas I was already familiar with, but Bell’s list provides a great sanity check, a way of making sure that the elements are in place to make the story compelling. Bell refined my thinking on the midpoint. In Wells’s seven point structure, this is the moment when the protagonist becomes pro-active. For Bell, it’s a point where the forces arrayed against the protagonist seem so vast that if they go on they will almost certainly face physical, psychological or professional death. These are quite different things to build the centre of a story around, but what strikes me is that they’re both about the need to make a decision to act, whether by switching from passivity to pro-activity, or by deciding to act despite the danger. I think that combining those two could make for some incredibly powerful central story moments. A good character arc is almost always about change. Bell points out that this change needs to be proven by the character’s actions, not just something they think or talk about. By working outwards from inner revelation to actual acts, you prove far more effectively that the character has changed, both to the reader and to the other characters in the story. The need for characters to have flaws is common advice. Bell suggests a refinement of this, that if you can it’s good to give your central character a moral flaw that is hurting others. OK, that’s a potentially very dark point, but it’s similar in value to that point about proving change. A moral flaw that hurts others is more substantial – it has real consequences, not just internalised angst, and it matters to other characters. It’s a much more substantial flaw. Your lead character’s name, vocation and initial situation. ‘When’ + the main plot problem. ‘Now’ + the death stakes. OK, I didn’t actually use the words ‘when’ and ‘now’, but the essence of the structure is there. And I don’t know about you, but I’m more excited about my book after seeing it summarised like that. That’s most of my blurb right there. I struggle with motivation a lot. These were good reminders of things that I know in principle but often forget in practice. 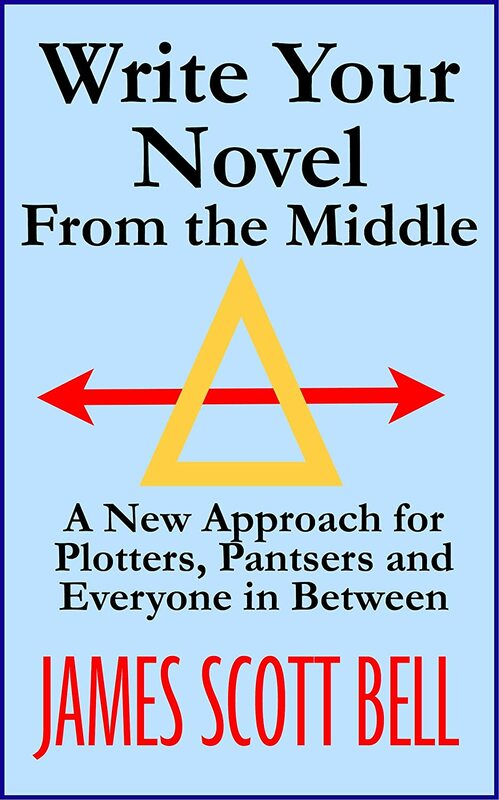 The focus of my previous post on Write Your Novel From the Middle probably seemed down on the book, because I was disappointed after hearing it raved about. But as I also said in that post, there was stuff of real value in there, and I consider it time and money well spent. Just not the game changer it’s sometimes sold as being. Take a favorite piece of media (but not something YOU created,) and reverse engineer an outline from it. I’m not going to do this one in huge depth. It’s an exercise you could potentially keep working at indefinitely, and I’m a bit strapped for time. So I’m going to have a look at what’s happening, and what’s being promised, in the first few pages of one of my all time favourite comics – issue 6 of Waren Ellis and Darrick Robertson’s science fiction series Transmetropolitan, a story called ‘God Riding Shotgun’. 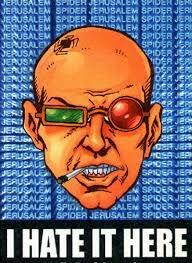 The first page is a splash page – a single large image of journalist Spider Jerusalem typing a rant about religion while dressed in a fake beard, a tin foil halo and a robe made from a stolen bedsheet. The promise it’s setting up is obvious – in this issue we’re going to see Spider’s take on religion. And because Spider can’t write about anything without getting in people’s faces, that means he’s going to end up fighting, verbally or physically, with priests. But there’s something else as well. The story Spider is writing involves a taser-wielding priest of the Official Siberian Church of Tesla. This indicates that religion has got pretty weird in Spider’s city, and sets up the expectation of more weirdness to come. Page two sees Spider waking up his assistant Channon, who isn’t happy at the disturbance. The religious angle is temporarily set aside to set up another plot thread – developments in the relationship between Spider and Channon. This issue sees a turning point, in which the usually abrasive Spider breaks down his assistant’s defensives and is then forced to admit that he’s been acting like a jerk. This page sets that up by showing the status quo we’ll be moving away from – Spider being a jerk and Channon accepting it. On page three, Channon realises that Spider, high as a kite, has woken her up at 5:30 in the morning. It’s a way of throwing in a conflict early on to keep things exciting, giving the issue’s main plot time to develop more slowly, and promises future friction between these two characters. It also moves along the sub-plot about their relationship – the status quo is disrupted by Channon arguing back. The end result, for now, is Channon questioning how much longer Spider’s body can take the abuse he’s giving it with drugs and lack of sleep. In terms of the series, this is foreshadowing a problem further down the line by pointing out to the reader that their might be a downside to Spider’s wild lifestyle. Page 5’s central point is a conversation about the huge number of new religions springing up in the city, and ends with Spider demanding that Channon find him churches. The conflict with religious representatives promised on page one is now about to turn into action. The drug-addled journalist is going to go out into the world and find, or make, a religious story. It’s the turn that leads us into the plot proper. This exercise made a change from the previous ones, in which I got to be creative. Even just doing it briefly, it helped me to understand what Ellis was doing structurally in building this story, and so to think about how I could use similar tricks. The early conflict in the sub-plot to buy time for the main plot was a particularly neat touch. If I have time later I might come back and analyse the rest of this issue, because this was interesting and I love reading Transmetropolitan, in all its foul mouthed and angry grandeur. Anyone else had a go at this exercise, or feel like giving it a try now? Just have a think about the chapter you’re reading or the program you’re watching and see if you can work out what’s going on structurally. Let me know how you get on – share your results or a link to them below. It’ll be interesting for me to see what others got from this. Whatever we do in life, we get better by learning from other people. Whether it’s plumbing, writing or how to make the perfect fried egg, even if we don’t agree with them, seeing someone else’s technique can help us reflect on our own. I’m always going to have a lot to learn about writing as a craft – anyone who writes does. So when I see a lot of people enthusing about a writing book, I’m going to give it a go. Several people I respect have recommended James Scott Bell’s Write Your Novel From the Middle, so it seemed like time to give it a go. I like having structures to write with. They act as reminders of the fundamentals needed in a story. If they’ve worked well before then following the structures others use can help you to write something better, something more readers will enjoy. I know some people don’t like the idea of following a structure. They think it constricts creativity. I disagree. I think that structures support creativity, and only becoming stifling when you follow them blindly. To paraphrase Pratchett, rules are there so that we think before we break them. That’s the benefit of using a structure like Bell’s – it means you don’t have to reinvent the plotting wheel, but can spin off from it when you feel that’s appropriate. There’s no doubting that Bell provides a useful structure. I can see why this book is popular – it presents a clear approach that’s easy to use, ties together character and plot, and should provide the ups and downs a story needs. It’s even got a neat little gimmick to sell it by – that you’re starting from the middle. It’s not entirely true, but it is a neat gimmick. But this book didn’t blow my mind or provide me with massive new ideas in the way I’d hoped for from the hype. I think that’s because I’m already following a structure much like Bell’s, but from a different source. Bell’s structure has a lot in common with the seven point story structure favoured by Dan Wells, and which I use for almost all my stories. You don’t really start in the middle, you start by knowing where you’re going from and to, work out what the key turning point is at the centre of the book, and build in turns and pinches from there. The labels are different, and Bell adds some useful details I wasn’t using before, but in many ways it’s the same beast. If you want to strengthen your plotting this is definitely a useful book. I’ve noted down half a dozen things from it in my notebook on technique, and if I hadn’t already seen Wells’s structure talk it would have hugely reinvigorated my writing. But because of where I’m at, it didn’t entirely live up to the hype. It’s useful to have a range of structures you can work with, so that you can pick one that suits you. Bell’s writing from the middle is one more useful structure. It’s just not one I’ll be following.